My red beet hummus and veggie plate is a stunner, if you ask me. This is how it came to be, and how to make it. A few weeks ago, we ventured out to the Minneapolis Institute of Art. After seeing a few exhibits, we developed a hunger and a thirst. All we wanted was something small, to tide us over to dinner. We ended up sharing the neat little bento box you see above that we bought at Half Pints, a new snack counter aimed at the Institute’s younger crowd. 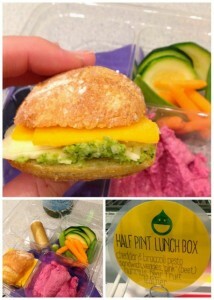 The “Lunch Box” we selected contained a cute little cheese sandwich with broccoli pesto, pear fruit leather and creamy “pink” beet hummus with veggies. 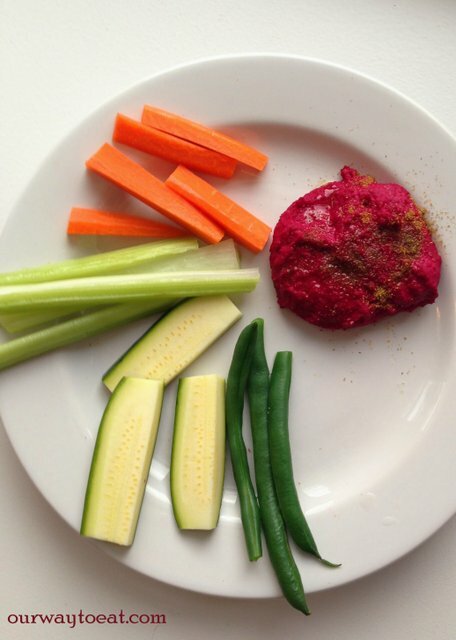 We aren’t the 5 year olds this lunch was designed for, but we might as well be, because we thought it was the perfect healthy and satisfying snack along with a big bottle of mineral water. 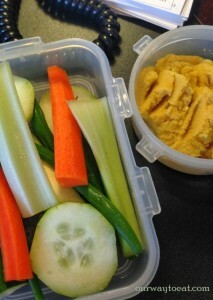 I often make hummus for us to pack up for lunches and snacks at work. We’ve been around the block with regular chickpea hummus, extra garlicky, white bean and purchased roasted red pepper varieties. 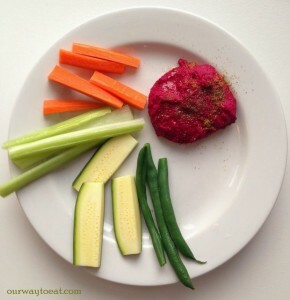 Discovering beet hummus gave me the inspiration to add some much-needed variety, vibrant color and a unique flavor to our hummus. The result was gorgeous and is just what we need to provide the brightness and potent superfood fuel we need to help us down the last dregs of winter. 1 medium or large red or golden beet, scrubbed clean, boiled or roasted, peeled, and cut into chunks. Cook’s note: the brilliant color and slightly stronger flavor of red beet is the boldest, while the golden beet’s color turns out slightly subdued when ingredients are combined and the flavor is also more subtle, unless you double the lemon and garlic, like I did–it was zesty! 1 14 ounce can of chickpeas or cannelini beans, rinsed (or dry beans that you’ve picked through and soaked overnight.) When I use chickpeas, I remove their skins so that the hummus will be extra smooth. Optional garnishes: olive oil, cumin or paprika. Boil or roast and peel the beet, cut it into chunks that will fit in your food processor (I use a Ninja). Pulse beet in processor until smooth, add beans, lemon zest, garlic and cumin and process. Add tahini (if using) and lemon juice sparingly, one-half teaspoon at a time, pulse hummus until smooth and creamy. 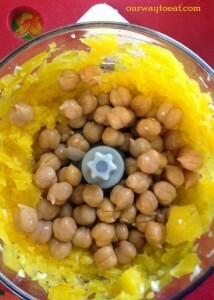 Add additional lemon juice or a little water as needed to make the hummus the creaminess you desire. It is best not to go overboard with lemon juice, as the flavor can overpower the beet. Adjust flavor with salt and pepper. Serve with crudites, wedges of pita or crackers. If serving at a party, drizzle with olive oil, and garnish with a pinch of cumin or paprika.